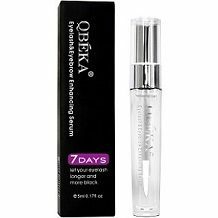 This review focuses on a product called QBEKA Eyelash & Eyebrow Enhancing Serum. This product is designed to improve the growth of eyelashes and eyebrows making them longer thicker and fuller. It is said to reactivate dormant follicle cells. The manufacturer promises results within 7 days. We aim to test the validity of all of these claims and helpyou, the customer, to determine if this is the right product for you. Bio enzyme EPM is basically tissue Growth Factor that cells use to naturally enhance their own growth. It is specific to follicle cells and is used to improve the growth of hairs during the developmental and division stage. The remainder of the ingredients serve to support the health of the follicle cells by nourishing them and supporting other molecular functions. Healthy follicle cells produce better lashes and brows. The tocopherol is an antioxidant which protects the follicle cells from damage by the environment so that they do not produce lashes of inferior quality. Before using the product it is suggested to clean the face and remove makeup from the eyelashes. Then apply the product to the root of the eyelashes and eyebrows in the morning and in the evening. The product takes about 2 minutes to fully absorb. If any of the product gets into the eyes, there is no reason to worry as this should not cause any problems. 0.16 fluid ounces of can be purchased online but the manufacturer’s website does not mention the price. The product is available on Amazon for $9.97. There are no discounts for this product on Amazon and the price does not include shipping or taxes. There also does not appear to be any subscription service for regular order of the product. The manufacturer offers some sort of returns policy where the product can be returned within 7 days after it has been received. It is absolutely vital for the customer to contact the manufacturer before returning it otherwise it will not be accepted. This returns policy is only valid for items which have not yet been opened. Amazon has a 30 day return policy, but it is unclear if this is valid once the item has been opened. This product contains interesting ingredients, most of which are well supported by scientific evidence. This product is quite easy to use and the instructions are quite clear. It is unfortunate that there are no discounts or subscription services available for this product because it makes the product more tedious to purchase over and over. The guarantee from the manufacturer is far too short to have any benefit to the customer at all, and customers are therefore taking a risk when buying this product because if it doesn’t work they are unlikely to get their money back. We believe there’s certainly better products on the market than this one, especially those that offer bulk order options and come with a strong guarantee.